When B Corp companies focus on fellow B Corporations as their target market–it’s evident that something amazing is happening. No longer are B Corporations far and few between. There is still a ways to go, but speaking with the folks over at RoundPeg really got me thinking about the B Corp network in a new way. Not only are B Corporations willing and enthused to help one another–but they’re proactively doing business with each other. RoundPeg provides marketing expertise to their B Corporation peers (as well as other purpose-driven companies), crafting effective strategies to market their missions and strengthen their brands. 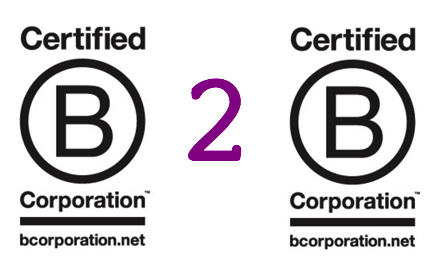 I’ve cleverly coined a term for this business interaction: B2B (B Corp business to B Corp business). RoundPeg is on a mission to help purpose-driven enterprises (many of which operate as business-to-consumer companies) increase their profits. We know that when B Corp businesses earn more money, they have the capacity to do more good. When RoundPeg provides expertise to their B Corp clients–and other socially responsible businesses–they’re helping them retain loyal customers and build communities of influence. On my journey to learn more and inspire others to pursue effective corporate good, I spoke with Anne and Alison from RoundPeg. Anne is partner and director of strategy at RoundPeg where she spends most of her time figuring out how to use marketing to help people make good choices. Alison is RoundPeg’s content marketing specialist, seeking inspiration, writing content and encouraging the world to believe in their clients’ missions. Anne and Alison paid tribute to the fact that B Corporations possess the unique ability and potential to create scalable impact. This sets them apart from traditional businesses. In addition to this, they emphasized the need to fill the current void in the marketplace. B Corporations seek and demand marketing professionals who are as open-minded as they are. They’re in need of professionals who understand B Corp at its core. RoundPeg’s shift towards a more focused B2B (B Corp business to B Corp business) model began back in 2011. One of their clients was a B Corp and was in search of some top-notch marketing to help illustrate and share the importance of their new certification. As RoundPeg dug deeper into their research and built a brand around their client’s mission and business model, they realized that the B Corp movement aligned strongly with their values and the way they were already doing things. This is when Anne and the team took their business a step further. Alison and Anne could not say enough about the B Corp network of individuals and businesses. They poked fun at the “old days”–not so far back in history–when a lot of us viewed corporations as big and bad. It’s incredible how quickly this stereotype is shifting as more businesses (small and large) move towards providing more to society by expanding their definition of the bottom line. Beyond having a network of like-minded companies to be inspired by, Alison and Anne explained that the B Corp network wants you to do well. They reflected on those moments in time when they had reached out to the B Corp network and were reminded by that fact that this community is about more than everyone just saying ‘we’re connected around the same belief.’ Everyone actually helps each other. I think Anne sums it up best. We wrapped up our conversation on a high note, resolving that we all have a lot of belief in the B Corp movement and that we want to prove to the world that it works. 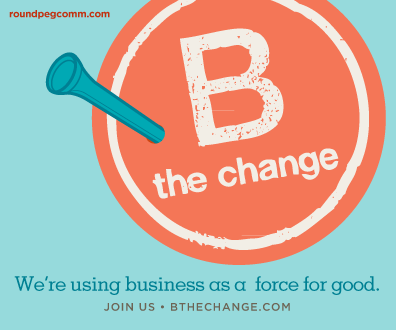 Want to read more about B Corp to B Corp businesses? Check out my other posts from The B Series featuring Bullfrog Power, OpenConcept Consulting Inc. and Susty Party. If you’ve enjoyed this installment of The B Series, be sure to follow the blog and follow me on Twitter @CSRtist for more inspiration on effective corporate good. Thanks Alison–I had a fabulous time working with you & RoundPeg on this project! Spoiler alert: one of my next posts will feature a circular-economy B Corp fashion company. CSRtist (Melissa) – Thank you so much for all you are doing to help people understand and embrace business as a force for social good. And double thanks for taking the time to speak with us about the emergence of B Corp to BCorp businesses! My pleasure Anne! Thank you for sharing RoundPeg’s story and for inspiring others to conduct business with purpose. I’m so glad Alison Klein posted information about this blog on the B Hive. Wonderful piece and I really enjoyed reading through the other B Corp related blogs you’ve done on csrtist. Great way to spread the word! My families B Corp, Topical BIoMedics, would love to take part in your series. Our products bring B Corp values and inspire sustainability within various channels of healthcare. Thanks again for the informative and inspiring series! Richard, thank you so much for your kind words. It’s great to hear that you’ve enjoyed reading through. I would love to speak with you more about your family’s B Corp! I’ll be in touch shortly. Thanks again for stopping by!